The bread shortage has hit Sudan’s cities for the past three weeks, including the capital. In the past year, the cost of some commodities has more than doubled in Sudan, where inflation is running at close to 70 percent and the pound has plunged in value. Eight demonstrators were killed in eastern Sudan on Thursday, officials said, during clashes with riot police on the second day of protests over the rising price of bread. The protests spread on Thursday to the Sudanese capital Khartoum, where riot police fired tear gas to disperse demonstrators near the presidential palace, witnesses said. The toll included a university student whose death during demonstrations in Al-Qadarif had been reported earlier in the day. “The situation in Al-Qadarif is out of control and the student Moayed Ahmad Mahmoud was killed,” said Mubarak al-Nur, a lawmaker in the city 550 kilometres (340 miles) from Khartoum. Nur called on authorities “not to use force against demonstrators, who are asked to peacefully exercise their right” to protest. Two other protesters were killed in the city of Atbara, around 400 kilometres east of Khartoum, governorate spokesman Ibrahim Mukhtar said. 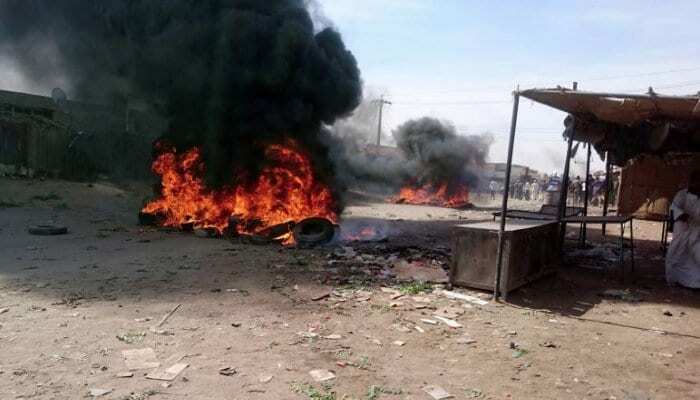 Police in Atbara fired tear gas to disperse protesters just hours after authorities imposed a curfew on the city because demonstrators had torched the headquarters of President Omar al-Bashir’s National Congress Party (NCP). According to local sources, angry protesters on Thursday set fire NCP headquarters in two other locations, in Sudan.